composer (1756-1791) and his father (1719-1787). 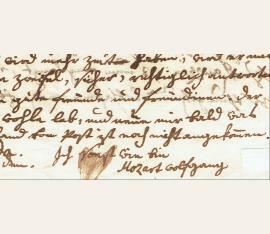 Autograph letter signed by Wolfgang Amadeus to his sister Nannerl. Milan. 4to (22.3 x 18.6 cm). 2 pp. Leopold Mozart is writing to his wife from Milan, on his third and last trip to Italy with Wolfgang, an on the occasion of his twentyfifth wedding anniversary. Leopold informs his wife of the health and welfare of his travellers, gives news of the stormy weather and the violent thunder and lightning, of Wolfgang Amadeus, their new lodgings, Italian ffod and beds, sends best wishes on their wedding anniversary, announces the arrival of the castrato Venanzio Rauzzini, who was to perform in Mozart’s ,Lucio Silla’ in December 1772, refers obliquely to the amount of work still to be done by Wolfgang and sends his and his son’s love; in his part of the letter, Wolfgang sends his apologies for not writing to Herr von Hefner, gives his reasons for not writing and expounds on this in an increasingly jocular manner, sends his best wishes to his sister and his mother, and adds his name, date and greeting backwards. ... [Leopold:] Heut ist die Jahrzeit unseres hochzeit tages. Es wird, wie glaube, 25 Jahre seyn, daß wir den guten Gedancken hatten nun zu verheyrathen. - - Diesen Gedancken hatten wir zwar viele Jahre zuvor, gute dinge, wollen ihre Zeit! Der Primo Uomo Sg. Rauzzini ist nun angelangt, es wird nun also immer mehr zu thun geben und lebhafter werden. Es wird aber auch an kleinen Comoedien wie es beym Theater gewöhnlich ist, nicht fehlen. Das sind kleinigkeiten! die feigen, die H: Joseph bey der abreise dem Wolfg: gegeben waren so wundersamm wie das Brod und die Fische im Evangelio, dann gestern assen wir noch davon zur abendmalzeit, die täglich in nichts als trauben und Brod und einem glas wein bestehet. Wir empf: uns allen guten freunden u[nd] freundinen der tag ist Kurz! Es giebt viel zu thun, ist es keine Arbeit, so sind es halt dennoch verrichtungen, wir küssen euch - so oft ihr wollt - und bin sammt dem Wolfg: ... [Wolfgang:] Ich sage dir danck, du weist schon für wasss, dem H: von Hefner bitte ich um verzeyhung dass Ich ihm noch nicht geantwortet habe. allein es war ohnmöglich und es ist noch ohnmöglich, dann so bald Ich nach haus kome, so giebt es was zu schreiben, liegt oft schon was auf dem Tisch, und ausser dem haus, auf der gasse kan ich ohnmöglich nicht schreiben, wenn du ihn siehst[.] zu lassen Ihm dieses folgende lesen, und Ich bitte ihm er soll sich unterdessen mit diesen begnügen ... An extraordinary letter uniting the four members of the Mozart family: Leopold, Marie Anna, Wolfgang Amadeus and Nannerl on the twenty-fifth wedding anniversary of Mozart father and mother. In their time, Leopold and Maria Anna were considered the handsomest couple in Salzburg. The letter encapsulates a poignant moment of family harmony: less than six years later Maria Anna would die far away from her husband in Paris, an unwilling travelling partner with Wolfgang on his disastrous journey to the French capital. Not the least attractive feature of Mozart’s letters is the characterful nature they reveal of the writer, by turns boisteroius, playful, sentimental and occasionally ribald. The present example reveals the characters of both the father and the son: On the one hand there is Leopold’s touching reference to his marriage twenty-five years ago to the day and his description of the improvement in his Milanese lodgings, which he illustrated by providing the dimensions of the bed in which they slept: and on the other, Wolfgang’s character is revealed in the increasingly jocular tone of the letter, ending almost in gibberish, with the sentences reversed: even his ,Addio’ and the date are written backwards. Leopold and Wolfgang were making the third journey to italy, arriving in Milan on 24 October 1772. At the time of this letter Wolfgang was at work on the choruses and arias for the opers Lucio Silla, which was premiered there on 26 December. Leopold discusses the activities of the singer Venanzio Rauzzini, the castrato, who was to perform the role of Cecilio in the opera. Mozart’s practice was apparently to await the arrival of the singer, to hear them perform and then compose the arias for them. Leopold hints in this letter that the arrival of the singer signals more work for them. After the successful reception of the opera Mozart wrote the celebrated motet Exsultate, jubilate, K.165 as a token of thanks for Rauzzini. A transcription of the letter, with a number of minor divergences from the original, is published in Mozart: Briefe und Aufzeichnungen 1755-1776, ed. W. Bauer and O. E. Deutsch (Basel, 1962), pp. 461-462. The six, mostly oblique, cancelling strokes found in the letter were made by Georg Nikolaus von Nissen during the course of his study of sources for his biography of Mozart. References: Anderson 162 and 162a, pp.216-217. Sotheby’s: 15 May 2008, lot 80..